Executive Director Captain Todd Creekman, USN (Ret.) pours the contents of a Ballantine’s Beer out. The bottle and cap were donated to the Naval History and Heritage Command Curatorial Branch Wednesday. A few of us in the room stared at the vase as the amber-colored liquid poured out of the bottle. There was a surprising hiss of carbonation once the bottle cap came off. NHF Executive Director Captain Todd Creekman, USN (Ret.) picked up the contents and sniffed it. He looks up surprisingly and exclaims, “It smells like beer.” It did. There was a mild sour and vinegary note to it as well. Other than that, it smelled like old beer. If you are wondering what 70-year-old beer looks like, here is your proof. If you are wondering what it tastes like…well…you will have to find out for yourself. 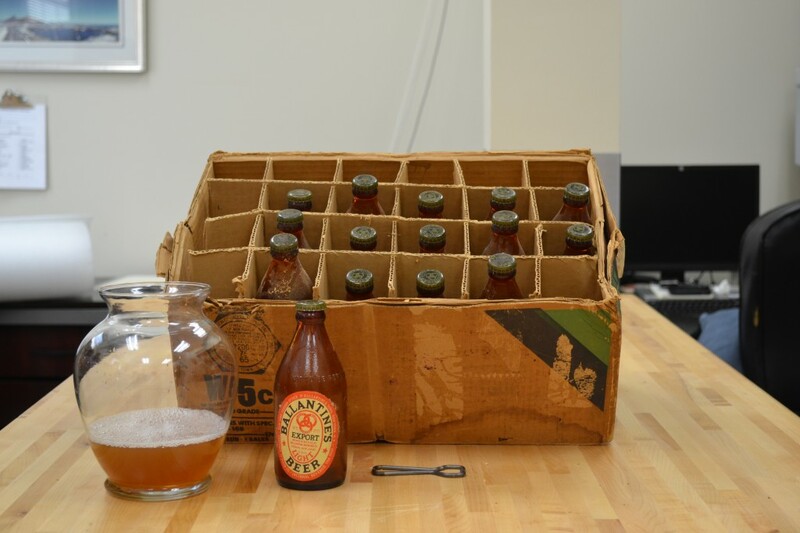 On Wednesday, The Naval Historical Foundation donated two World War II-era beer bottles to the Curatorial Branch of the Collections and Management Division at the Naval History and Heritage Command. NHHC Curators Clarissa Frank and Connie Beninghove were on hand with several NHF staff members (former and current) to witness the transfer of bottles. The bottles originally belonged to former Navy Lieutenant Wayne L. Yoakum. Yoakum served on the USS Coghlan (DD 606) during World War II, where he procured the bottles. How the bottles come to the Foundation is an interesting story in itself. Mr. Yoakum interviewed for the Library of Congress Veterans History Project back in 2011. During the course of the interview, Yoakum mentioned a few possessions he kept during the time he served in WWII that he intended to donate. 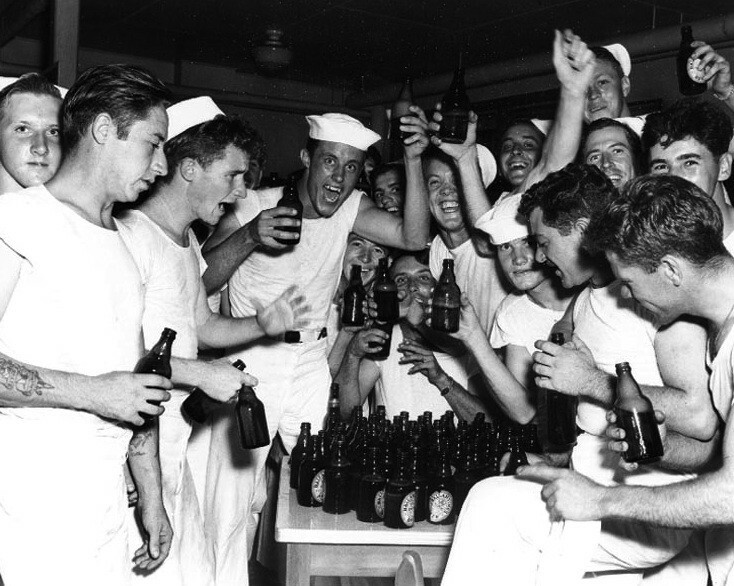 Among the items was an entire case of Ballantine’s Beer, a popular libation for sailors and civilians alike during the war. 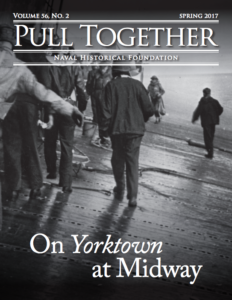 Yoakum donated the case to the Naval Historical Foundation in 2012. According to Yoakum, ships routinely carried certain alcohol stores for the crew for medicinal purposes or in the chance liberty was granted at a designated recreation area. 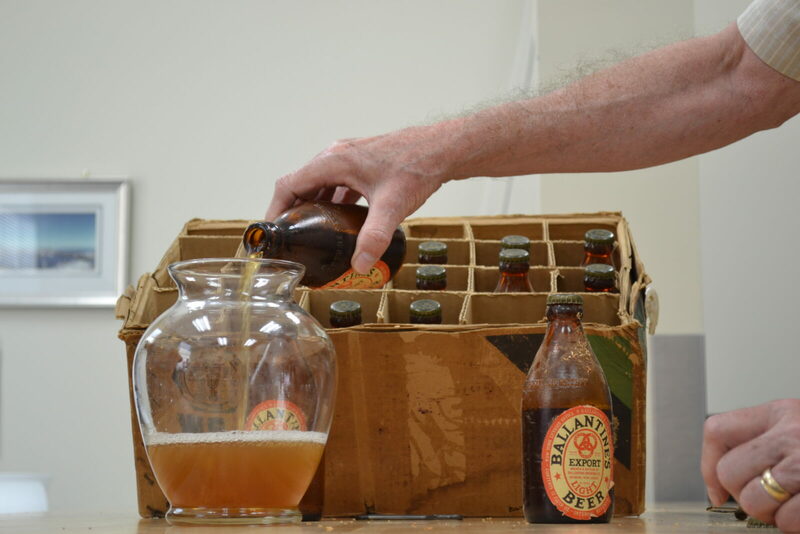 The case of Ballantine’s Beer donated to the Naval Historical Foundation was originally offloaded by Yoakum from the USS Coghlan (DD 606) at the Mare Island Naval Shipyard in 1945. The box of beer and several other items traded from troops ashore following the battle for Saipan arrived at the Foundation in January 2012. 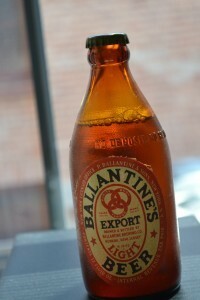 BY BALLANTINE BREWERIES, NEWARK, N.J. Under government policy, the Naval History and Heritage Command cannot accept artifacts with liquids. We had to empty the contents of the donated items, much to the delight of NHF and NHHC staffers. CALLING ALL INTERESTED PARTIES: THIS SUDS FOR YOU! The Ballantine’s label is a brand with a rich history and proud heritage in Americana dating back to the mid-19th century. It was the beer that sailors like Yoakum drank in peace and victory, and the official sponsor of the New York Yankees during their Golden Era. The remaining bottles could become an excellent addition to specialty breweries, museums, or historic societies seeking such a historic item. After several unsuccessful attempts to contact breweries related to the Ballantine’s label over the past two years, we are opening up bottles to those deserving institutions. We are currently looking for repositories, including beer museums and military museums that might want to add a bottle of this beer to their collections. Do you know a place that would like to have one of these vintage WWII-era bottles in their collection? 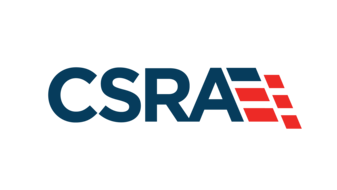 If so, please contact NHF Executive Director Todd Creekman at ccreekman@navyhistory.org. Or call the main NHF line at (202) 678-4333.